A New England intra-regional Interstate, Interstate 93 serves the Boston metropolitan area, northern Massachusetts through Lawrence, the state of New Hampshire, and the Northeast Kingdom of Vermont. The freeway provides a direct connection to Canada in conjunction with Interstate 91 north of St. Johnsbury, Vermont. Built as part of the Big Dig project, the Thomas P. O’Neill, Jr. Tunnel carries 1.5 miles of Interstate 93 below central Boston. The tunnel runs between Kneeland and Causeway Streets to directly link I-93 with the 2003-opened Leonard P. Zakim Bunker Hill Bridge. Through the White Mountains and Franconia Notch in northern New Hampshire, Interstate 93 transitions into a parkway, with a reduced right-of-way and two and three lane sections. The nine-mile Franconia Notch Parkway runs between Exits 33 (U.S. 3 north of Lincoln) and 35 (NH 18 near Echo Lake). This allows the freeway to intrude minimally on the sensitive areas of the Notch, including the former Old Man of the Mountain, which collapsed on May 3, 2003. Recreational areas are accessible along this stretch at Exits 34A, 34B, and 34C. The section in downtown Boston was reconstructed in one of the most expensive and dramatic projects in highway history. Known as “The Big Dig,” upon completion the project saw the removal of the elevated “green elephant” through Downtown (though part of the double deck in Charlestown remains). Traffic was relocated to a system of tunnels, as well as a new ten lane (six lanes northbound, four lanes southbound) cable-stayed Leonard P. Zakim Bridge over the Charles River (plus the four-lane Leverett Circle Connector bridge). This new span replaced the original six-lane double decker bridge. Unfortunately, the Big Dig had a lasting legacy. Its underwater tunnels had a tendency to leak and the project managers (Bechtel and Parsons Brinckerhoff) were accused of making decisions that resulted in extraordinary costs for the project. Cost overruns led NBC News to refer to this project repeatedly on its “Fleecing of America” segment. For more detailed information on the Big Dig, see The Boston Globe Big Dig Report. The northern areas of Interstate 93, in stark contrast, travel through the picturesque White Mountains of northern New Hampshire, before a terminus in scenic Vermont. 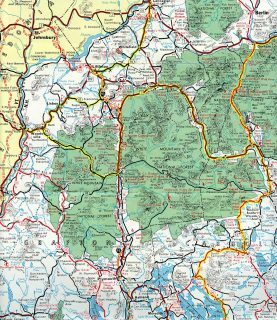 The section of Interstate 93 that runs along Franconia Notch Parkway is technically not a part of Interstate 93, as it does not meet current Interstate standards. It was constructed as a compromise between the park service and highway department. When originally constructed, the Franconia Notch Parkway carried its own exit numbers (1, 2, and 3) separate from mainline Interstate 93. However according to Jeffrey Moss this was changed in 2002, and the exit numbers are now continuous with the rest of I-93. This change was made because the transition from the freeway to the parkway is nearly invisible to the motoring public (aside from brown guide signs and the narrowing of the freeway), so it made more sense to keep the exit numbers consistent. Side access along the Parkway is restricted to exits and designated parking areas. Interstate 93 primarily bypasses communities along U.S. 3 in Massachusetts and New Hampshire. Where the freeway turns east-west, it briefly parallels U.S. 302 at Littleton, New Hampshire and U.S. 2 leading into St. Johnsbury. The first portion of Interstate 93 constructed in Massachusetts ran north 24 miles from Medford to the New Hampshire state line. Work ran from 1956 to 1963 as a cost of $47-million. Delays ensued on the three mile link southward to the Northeast Expressway (then Interstate 95) due to the relocation of residents and businesses along the corridor. It finally opened in 1973, around the same time that plans for I-95 within the Massachusetts 128 beltway (Yankee Division Highway) were dropped.6 This led to an extension of Interstate 93 southward along both the John F. Fitzgerald and Southeast Expressways to Braintree and west along the Yankee Division Highway toward Norwood and Interstate 95. 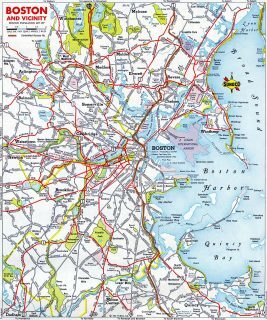 AASHTO endorsed the extension south from the Boston/Somerville city limits to Massachusetts 128 in Braintree on June 17, 1975, and the extension west along Massachusetts 128 on November 15, 1975. Within Vermont, the 11-mile stretch of Interstate 93 leading west to St. Johnsberry opened on October 29, 1982 after delays caused by agricultural lawsuits.6 I-93 would have been longer if I-91 was built further west toward Danville as originally envisioned. The corridor for Interstate 91 shifted eastward in 1963. 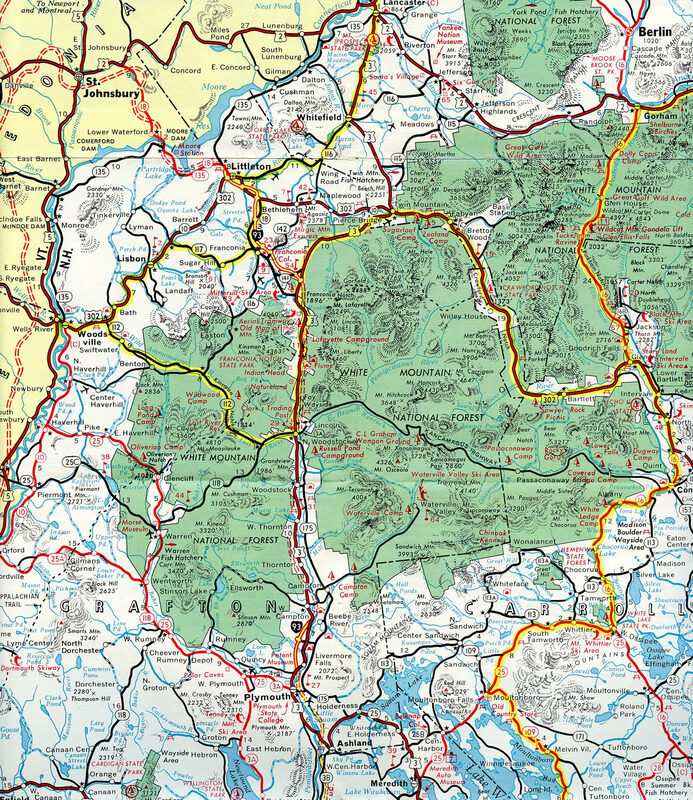 New Hampshire Official Highway Map – 1964. Two portions of Interstate 93 were open north of New Hampton, New Hampshire in 1964: a short bypass of U.S. 3 between Plymouth and Campton and the northwestern alignment from U.S. 3 near Franconia Notch to Littleton. The freeway was completed north from New Hampton to Plymouth the following year. An end advisory sign is posted for the upcoming terminus of Interstate 93. This is the only sign posted of the Interstate end. Photo taken by Chris Jordan/Douglas Kerr (11/02/02). There is no exit number assigned to the Interstate 91 terminus interchange of Interstate 93 northbound. This button copy guide sign rests along the northbound side of the highway in anticipation of the tri-level stack interchange ahead. Control points featured are Saint Johnsbury (a small city just two miles to the north) and White River Junction (the point where Interstate 91 intersects Interstate 89, 55 miles to the south). A truck bypass of Saint Johnsbury for U.S. 2 is posted on Interstate 93 between Exit 1 (Vermont 18) and Interstate 91, and Interstate 91 between Interstate 93 and Exit 21 (U.S. 2). Photo taken by Chris Elbert (07/06). Interstate 93 concludes its three state course at the upper level of the Interstate 91 stack interchange. Note that the right-hand panel features a TO next to the Interstate 91 shield. There is direct access between the two freeways and thus, this the word TO is unnecessary. 49 miles separate Interstate 93 from the Canadian International border at Derby Line, Vermont. The state capital of Montpelier is 37 miles via Interstate 91 north and U.S. 2 west from this point. Photo taken by Chris Elbert (07/06). Button copy guide sign for Interstate 93/Exit 19 on Interstate 91 southbound. The control city of choice is that of Littleton, New Hampshire, a quaint New England town of 4,431 at the Interstate 93 crossing of U.S. 302. Photo taken 07/00. Simple sign bridge on Interstate 91 southbound at the split with Interstate 93/Exit 19. By far one of the most scenic stretches of New England freeway resides on Interstate 93 between Saint Johnsbury and Plymouth, New Hampshire. Highlights along the route include the Connecticut River valley, the White Mountain State Forest, and Franconia Notch State Park (featuring the New Hampshire famous Old Man of the Mountain rock facade). Photo taken 07/00. Tri-level stack interchange of Interstate 91 and 93. The lowest level is that of Interstate 91 south to Interstate 93 south. This junction is the only stack interchange within the state of Vermont. Photo taken 07/00. Two miles east of Interstate 95 at the Blue Hill River Road diamond interchange (Exit 3). Interstate 93 & U.S. 1 southbound meet Massachusetts 138 (Massachusetts Street) one mile ahead. 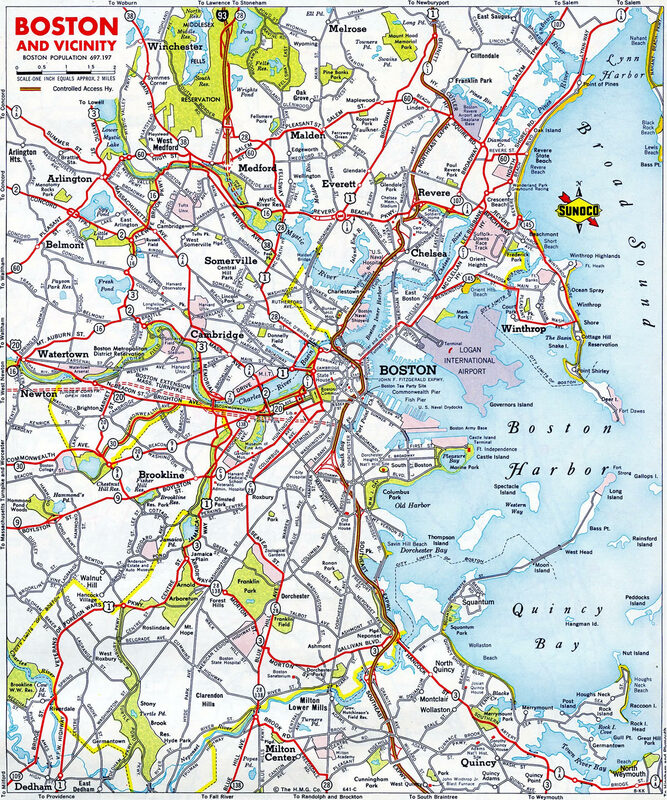 Where Interstate 93 ends, Interstate 95 takes over as the Yankee Division Highway northward to Needham, Newton, Waltham, Lexington, and Woburn. Photo taken by Steve Timmons (02/04). Interstate 93 leaves downtown Boston with U.S. 1 & Massachusetts 3 in tow to Braintree. There Massachusetts 3 splits from Interstate 93 & U.S. 1 along its own freeway southeast to Plymouth and Cape Cod. Interstate 93 & U.S. 1 turn west two miles to Massachusetts 24, a north-south freeway traveling south to Taunton and Fall River, and 4.5 miles to Interstate 95, the southern terminus of Interstate 93. Pictured here is a an end sign for Interstate 93 at Canton. Photo taken by Steve Timmons (02/04). The mainline of Interstate 93 (former Massachusetts 128) defaults onto Interstate 95 northbound toward Dedham and Norwood. U.S. 1 continues along the freeway another three miles to Exit 15 (Providence Highway). Exit 1 meanwhile constitutes the ramp onto Interstate 95 southbound for Foxboro, Attleboro, and Providence, Rhode Island. Photo taken by Steve Timmons (02/04). Entering the partially used interchange between Interstate 93 & U.S. 1 and Interstate 95. The Exit 1 ramp to Interstate 95 southbound splits with a ghost ramp that was intended for unconstructed Interstate 95 north. Additional abandoned ramps are found within the pervasive junction between the two freeways. The present configuration is however that of a trumpet interchange. Photo taken by Steve Timmons (02/04). Before Interstate 95 was signed around Boston, Massachusetts 128 signage adorned the beltway outside of the city. When it was decided to not build Interstate 95 through downtown, Massachusetts 128 became co-signed with Interstate 95 from Peabody southward. Therefore Interstate 95 south exits as a one-lane exit off Massachusetts 128 (the beltway) at Interstate 93 because of the planned routing through downtown Boston. In other words, only one lane exists for this ramp because Interstate 95 was never intended to follow the beltway in the original design. Ghost ramps exist at the interchange, including the overpass in this photograph, that constitute the never opened Interstate 95 northward. Additionally, this interchange marks the current southern end of Massachusetts 128. The state route once extended eastward to Massachusetts 3 (where Interstate 93 turns north) and even earlier to Hull on Massachusetts 228. Photo taken by Dan Moraseski (12/00). Two miles south of the Interstate 95 entrance onto the Massachusetts 128 beltway is this diagram guide sign. The cloverleaf design stems from the original plans of this interchange that implied Interstate 95 continue north into Boston itself. Photo taken by Chris Elbert (07/06). To continue north on Interstate 95, a sharp curve is required as shown in this diagrammatic sign. A pair of advisory signs also mention the sharp curve on the cloverleaf ramp at the junction with Interstate 93 and Massachusetts 128. Exit 12 is about one mile to the north. Photo taken by Chris Elbert (07/06). Interstate 93 northbound begins, arcing eastward to Quincy before turning north toward Downtown Boston. Neglected on all of the Exit 12 guide signage of Interstate 95 is U.S. 1. The US route utilizes the Boston beltway between Exit 15 of Interstate 95 and Exit 7 of Interstate 93. The highway maintains an overlap with Interstate 93 northward into Downtown. Photo taken by Chris Elbert (07/06). “$14.6 billion later, Boston’s Big Dig wraps up,” The Christian Science Monitor, December 19, 2003. “NH Celebrates 50th Anniversary of Interstate Highway System.” New Hampshire DOT, press release, June 29, 2006. “Last stretch of I-93 will open Oct. 29.” The Nashua Telegraph, October 19, 1982.